As I was finalizing my conference schedule for the ALA Annual conference this year, there was a blurb for one of the programs that caught my eye. It’s for a program entitled “Passing the Baton: Who Will Take It?” on Sunday morning. There are 72 million baby boomers, 11,000 Americans turn 50 every day, 4.6 adults turn 65 each minute, and almost 60% of librarians are 45 or older. There is little balance: only 7% of the library work force is age 20-29! In Roman times, there was a uncommon military discipline practice called decimation. Meant as a way to punish cowardly or mutinous soldiers, it was a brutal practice in which groups of ten would draw lots; one man would be selected to be killed by the other nine men through clubbing, stoning, or only with their hands and feet. This ‘removal of a tenth’ punishment sent a clear message to the survivors: your actions (or lack of action) put you at risk for a disgraceful death. It was warning to all, a vicious lesson that the cruelty of the battlefield is nothing compared to the cruelty of your fellow countrymen. We want to explore the twin appeals of information discovery and serving users that drive the devotion to reference and readers' advisory work. I have written about reference before in terms out how the interviews could possibly be measured (and maybe re-labeling reference service as an “information concierge”), but I had not really considered examining the interaction itself and the implications of all of the possible outcomes. When I start to turn this idea over in my head, something really caught me. Imagine the reference interaction as this: an intersection of time and space in which you (as the librarian) have the ability to influence the resulting experience. In the middle of last week, I got my coveted Google Wave invite. Ever since it had been announced, I had been excited for the September 30th open preview invite. While I didn’t get invited on the first round of invites, my proverbial Golden Ticket came a week after. I had just gotten in at the library that morning when I saw the “wave-noreply” in my Gmail. There was to be no work done that day. Indeed, I got into the interface and bounced around the boxes like a six year old on a sugar rush. What’s this do? What’s that do? I made a wave and started trying out all of the headers and extensions (those are the little programs you can add to your toolbar inside of wave). It was symphony of button mashing orchestrating a flurry of trial and error. As people came on, the discoveries continued to abound. (“I can see you typing!” “I can see you typing too!”) Over the last couple of days, people have been dragging files into waves and trying out applications and more extensions. I’ve been watching waves build up to over 100 members and options being added left and right. But, as there are many posts and write-ups about every aspect of Google Wave, I will go a different route to describe my ultimate impression. Earlier this week, the assistants on Andrew Sullivan’s blog The Daily Dish (rated one of Time’s Top 25 Blogs of 2009) sought to perform an experiment. The failure is not the technology. The capacity to download, store, and recall hundreds if not thousands of books is impressive. The ability to replicate the look of font on paper is incredible. Each generation of e-book devices is rapidly outpacing the previous incarnations with additional features such as internet browser, PDF support, wireless updates, subscription support, and multiple e-book file types. The technology in and of itself is grand and a true marvel of the modern times. 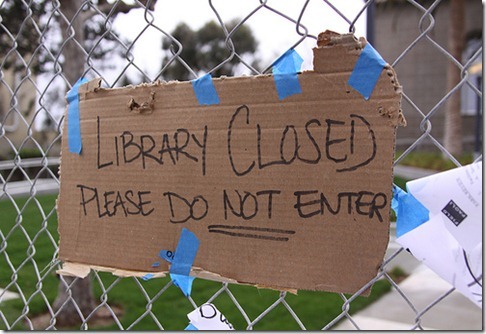 The failure is how the e-book reader companies do not consider libraries as a viable customer. The Associated Press is mad as hell and they aren't taking it anymore. While whom they remain angry at is somewhat nebulous, the venerable pillar of news reporting is looking to get a piece of the new media revenue pie by asserting greater control over their content. The current status quo is one where various types of web entities (such as Google, Yahoo!, and The Huffington Post) arrange licensing agreements in which they pay for the right to link to AP stories, audio, and videos. It is from here that the gray areas of the web emerge as sites, bloggers, and other aggregators link to the content that is generated through these AP licensees. On these tertiary sites, people can generate revenue from either ads or services that they provide while linking to AP product. For those unfamiliar with the library field, librarians have a strange relationship with technology. On one hand, the library field has been quick to follow new trends of audio and video technologies. Even as we speak, my library is moving towards Blu Ray and expanding web based technologies such as eBooks and downloadable content such as movies and mp3s. We are working on bringing the library and the patron closer together through the internet with an online calendar, databases, and other remotely accessed sources.